I have a wet and windy weekend this time around. Not much fun. So I am organising my craft room. At least that was the plan until I decided to make some cards half way through the organisation. But I am keeping my fingers from working too hard since the injury of my index finger last week. So no colouring. 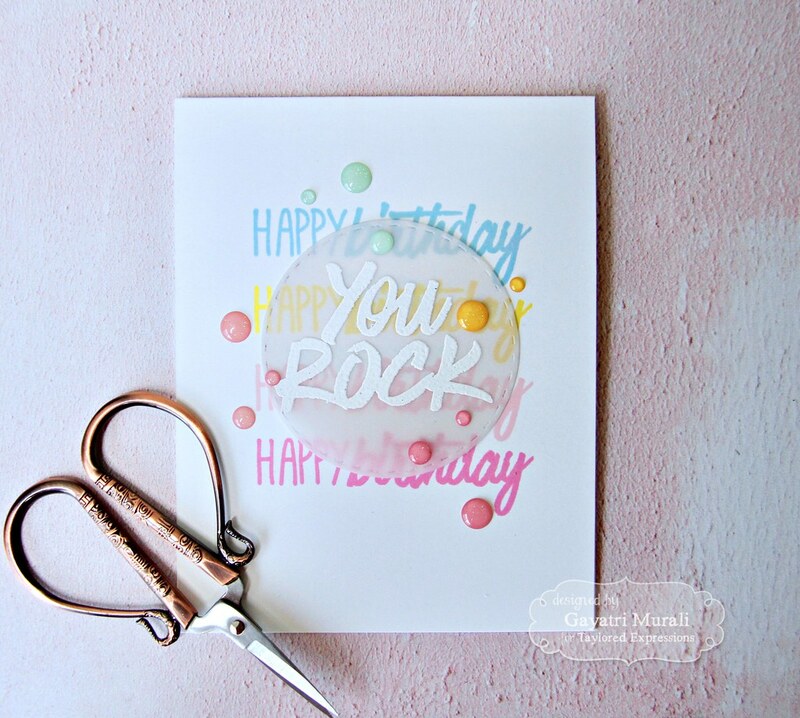 I went back to basics and did just stamping and made some clean and simple cards – stationery style. 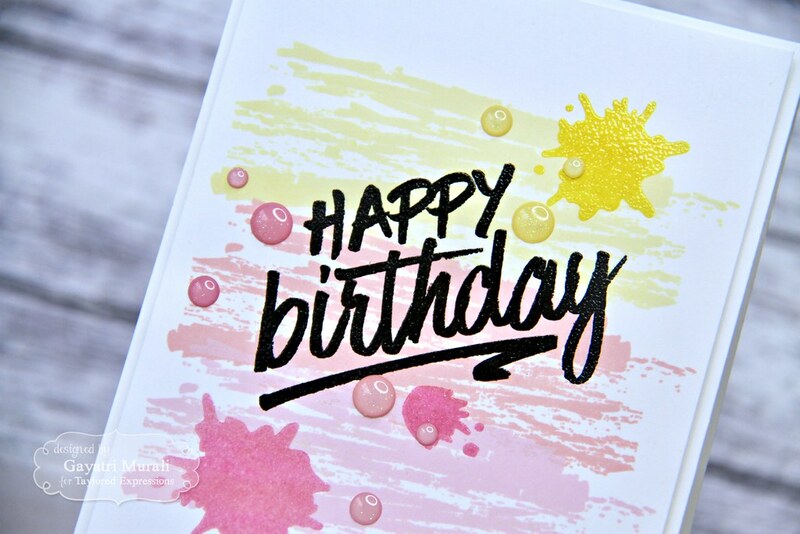 I have used some Taylored Expressions stamp sets to make these card. There are three cards to share with you today. 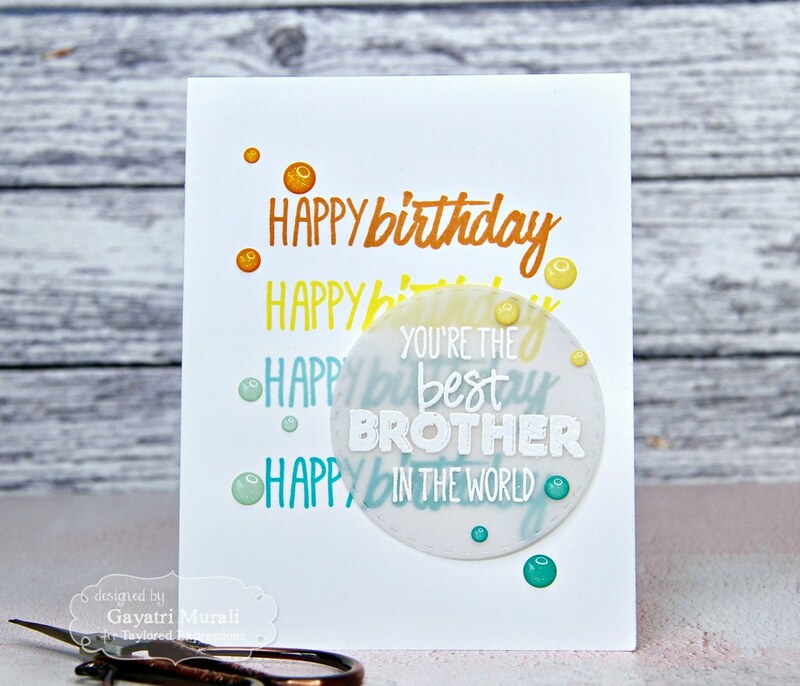 Two are similar layout and a third card which is different to the first two yet clean and simple with lots of white space. Here is the third card first. 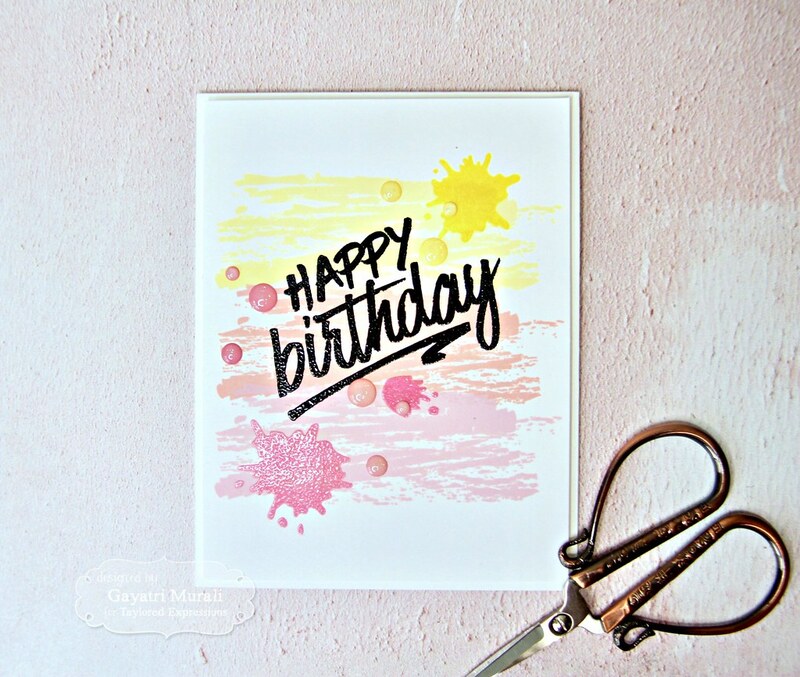 I used Taylored Expressions Stroke of Genius 2 stamp set and Bold Brushstrokes stamp set. 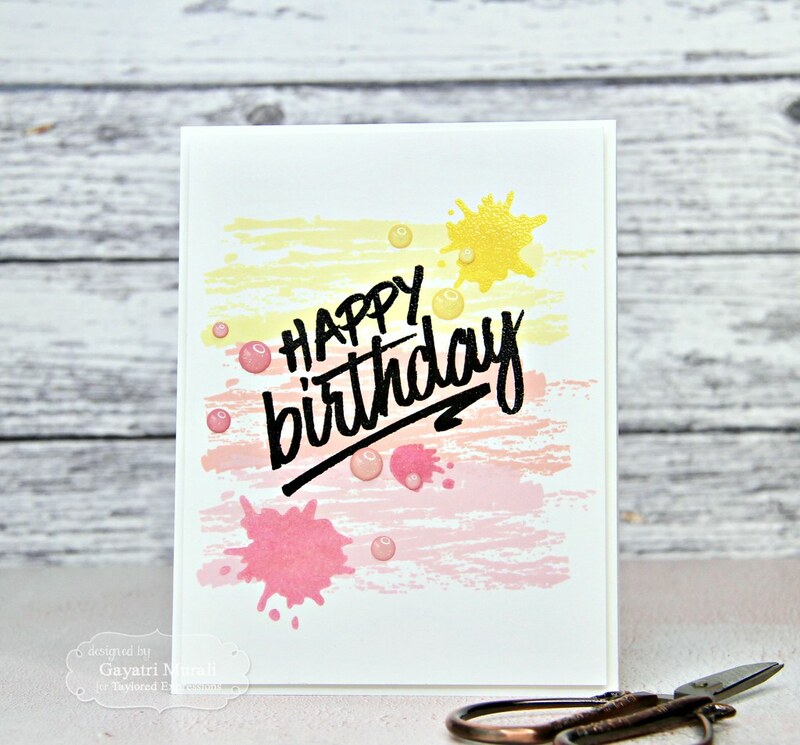 For the background, I used the large brush stroke from Stroke of Genius stamp set to stamp thrice using TE premium inks in Potato Chip, Pink Champagne and Cupcake colours. Then I black heat embossed the sentiment from Bold Brushstrokes stamp set. 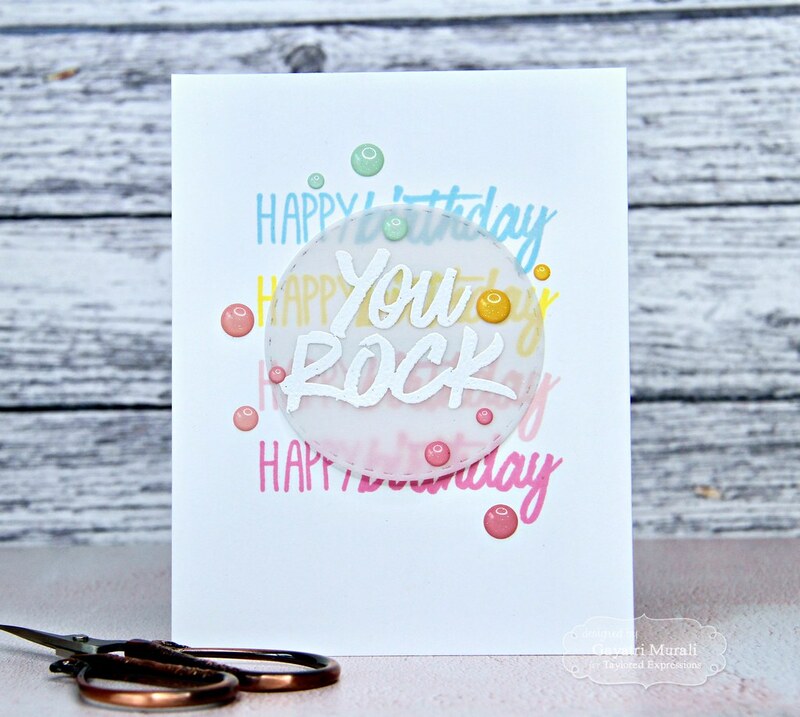 I stamped the spatters using Strawberry Milkshake and Lemon Meringue TE premium inks and again using versamark to clear heat embossed the spatters. Finally added Doodlebug’s sprinkles enamel dots to finish the panel. I trimmed the panel to 4″x5.25″ in size and adhere the panel to Sugar Cube card base using foam adhesives. The brush strokes images were all the rage some time ago. They are my all time favourite stamp sets. Great to make masculine cards. I adore them. So it was great to get them out and use them. Talking about masculine cards, you could just change up the colours to make one. Below I have a set of two cards with similar layout. I changed the colour on the second to make a masculine card. 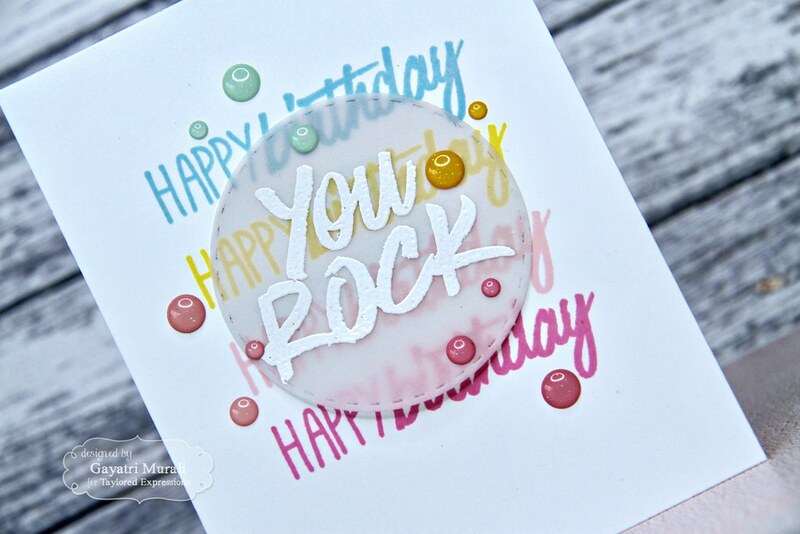 I used MISTI to stamp the sentiment from Best in the World stamp set. I set the stamp on the MISTI lid, stamped the first image, the moved the card base up by four grid to stamp the second image below the first and repeated the process two more times. 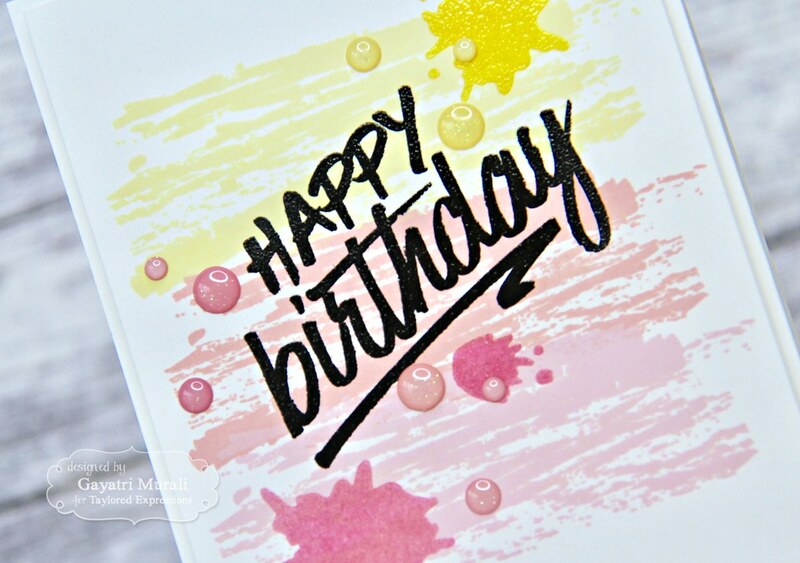 The inks I used for the first card are TE Sprinkles, Lemon Meringue, Cupcake and Strawberry Milkshake dye inks. For the second card, I used Candy Corn, Lemon Meringue, Sprinkles and Cookie Monster TE dye inks. 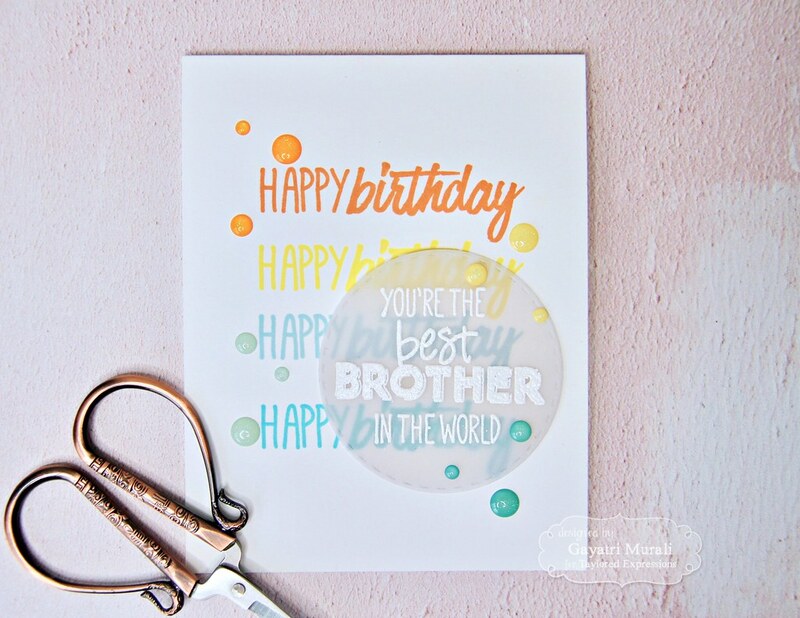 For the focal point on the first card, I white heat embossed the sentiment from Bold Brushstrokes stamp set on heavy weight vellum and die cut using TE stitched circle die. 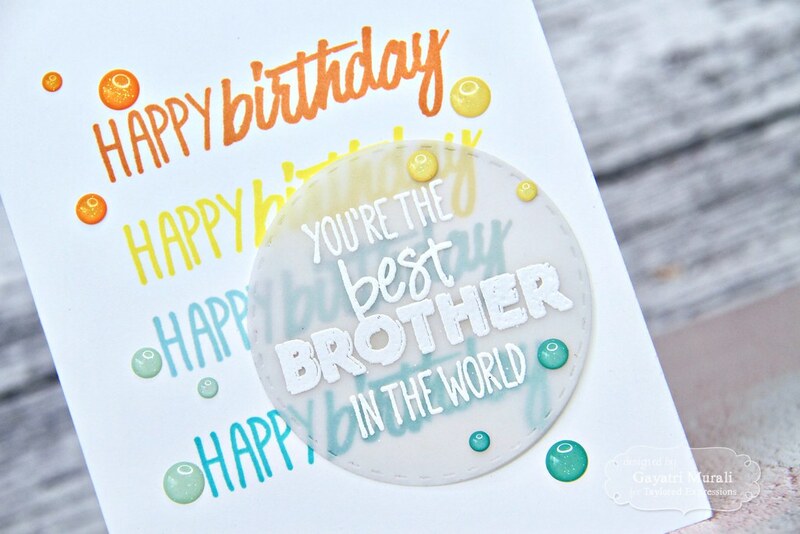 For the second card, I white heat embossed the sentiment from Best in the World stamp set on heavy weight vellum and die cut using the same stitched circle die. 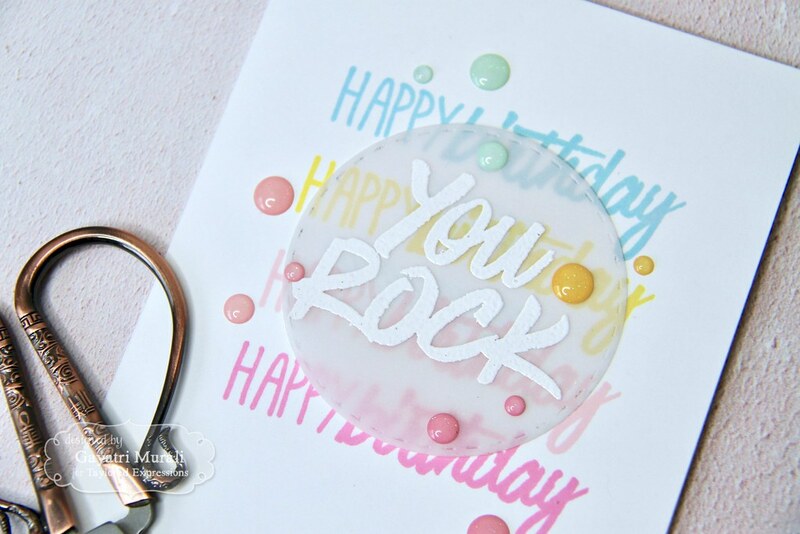 I glued the diecut vellum sentiment circle on the centre of the card front over the stamped sentiment for the first card. For the second card, I changed it up a bit and glued the sentiment vellum circle on the bottom right side of the stamped sentiment. 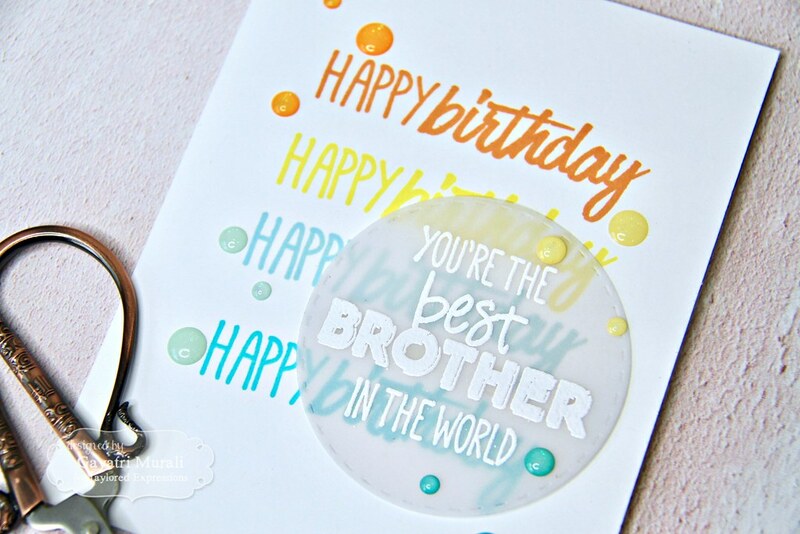 Doodlebug Sprinkles enamel dots in matching colours on both the cards to finish them up. Here are some closeups of both the cards. I just love the white space on these cards. The white space make the colours pop yet the card is not full of colours like how my cards normally are. You know what I mean? I think the designs also have the stationery feel to it. My son liked the design of it that he wants me to make a set in various masculine colours. Meaning no pinks or purple in it!!! I agree with pinks but purple in combination with green and/or yellow will make good masculine colour combo. 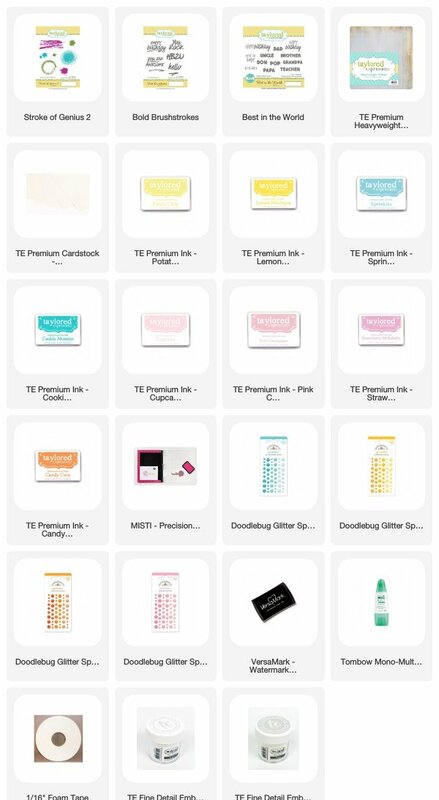 All the supplies used to make all the three cards are listed below. This is very different to my normal style of bright and colourful card. I enjoyed making them. Hope you like them. Thank you so much for stopping by! Have a lovely weekend. I love these cards! I struggle with coloring and shading so anytime I can just stamp colors works best for me. They are all 3 awesome, thanks for sharing and the inspiration on something I know I can do LOL. I love all of these! What a fabulous mix of colors and patterns and repetition!